There are a lot of repeated questions and answers on here, and some good videos that explain everything. I've got 2 maintenance and one X-axis stiffening video that I made that may help with some X-Carve maintenance and troubleshooting. Since a picture is worth a thousand words, videos have got to be worth a few more. If you've got a video, or like a video someone else has, put it up on here. Let's make a collection that will be easy to reference for various X-Carve users! Is anyone actually getting 5 thou accuracy? Belt working tension of 6.25 lbs? Why nothing in the assembly instructions? How long did it take you to get "dialed in"? Recommendations for modding the x carve 1000 for Aluminum Milling? Odd behavior and misalignment at "high" feed rates? Finish my build, then what should i do? How do I smooth x travel before belts? Anybody South of Columbus Ohio wanna help? Z axis makes grinding noise when testing? Unpredictable behavior in EASEL software? X-Carve Shipped! Any last minute tips? Offset carving - wiring issue? Here's a video I made on performing the X-axis stiffening modification. Does my Y axis sound alright? Here's a video I just made on measuring belt tension, and includes a method to make a quick tension gauge using scrap wood and a gallon of water. Xcarve carves the first half normally (50%) but when it is going to start the second half, it goes back !.5 inch, why? And, here's the last video of mine this weekend. A guide to adjusting potentiometers, hopefully it's not too confusing. G Code Error from Easel? How to engrave small lettering with the X-carve? Cannot get my X-Carve started! Here's another video that I hope will help. It shows how to adjust your stepper calibration (steps/mm) through Easel. Irregular box joint problems. Help! 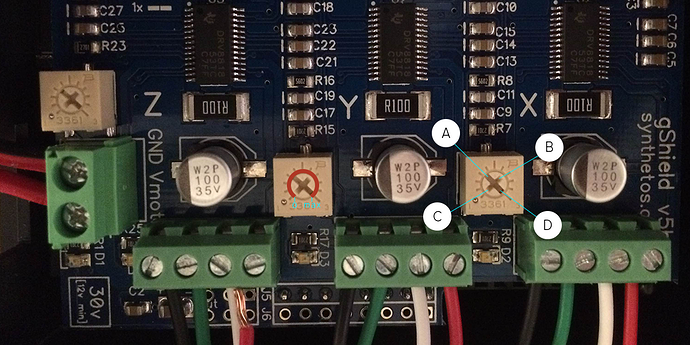 Current calibration procedure on the X-Controller using vref? I just realized that I haven't linked my assembly tips video on here yet. It's got some problems I noticed, workarounds, and alternatives that I came up with when I was building my X-Carve. Hopefully it'll be useful for those who are getting ready to assemble their X-Carve. The test pattern is a combination of precisely sized holes and such, designed to ensure there's no lost steps or other issues that can cause less-than-perfect carving. The 6-page PDF in the project explains everything, and even includes a datasheet to record information on. This video covers installation of a new secondary wasteboard, using the X-Carve to drill holes for access to the threaded inserts and to mill a pocket to square material to the home position. It also covers how to diagnose that a spindle is out-of-square with the wasteboard, which can cause lines or squares on the bottom of a pocket. You know, I really appreciate you posting these videos because it will help me tremendously! I hope to get to these topics over the next week. Thanks so much for the video. It really helped me dial in my machine. I see you are turning clockwise from your perspective, thus, I assume, counter-clockwise from the GBRL-shield normal perspective. I can not see very well in your video the marks or anything else, because of the blinding lights. The end that marks or indicates the level that I am at. I have my own assumption, but I may be wrong, so if you can tell me if I got the range ok.
A B C or D? From your picture, I would assume that clockwise is "up" and counterclockwise is "down", like you have marked on the Y. I'm not sure what the positions are, but you should be able to gently turn it all the way up and down and feel where it goes without breaking it. Knowing where the exact range is on the pot itself isn't necessarily important either, just mark one spot on the screw and mark the spots on the box itself where you start losing steps from low voltage and thermal cutout (high voltage). That'll give you a relative (and useful) range in which you can position the mark on the screw. Out of curiosity (I know it can vary), can you share a photo (like mine) of your positions? Here ya go. It looks like I have almost a 90 degree useful range on the Z, and much less on the X and Y. Makes sense with the amount of weight added from the steel bar and the router. I just turned my x-carve on for the first time. Passed by easel Setup. All the wiring is fine. Nevertheless, when doing the homing (and also when I move it manually), the Z axis starts moving up, till a moment where it can not move more without reaching the limit switches. Like if it was difficult for the machine. I still didn't do the potentiometers adjustment. But I can not do that before setting easel first, so I am stuck. Do you think it's related ... or that it's something else? Here is a video that shows the problem. Any tips would be very appreciated. I checked and there is nothing in the way or so. Nothing is colliding, or misplaced. 1. Potentiometer, turn the Z pot up a hair at a time until you've turned it 45 degrees. If it doesn't change by that point, that's probably not it. 2. Could be the threaded rod binding on the delrin nut. Did you run the nut up and down it a dozen times or so before assembly? It has to be broken in to work well. There's also potential that the threaded rod has a slight bend, which could also cause binding. Mine is slightly bent, all I had to do was work it up and down a little more. Hardly affects the machine. I don't recall. I think I did. For point 1. All clear, I will do that. For 2. Do I have to dissasembly the Z Axis to run the nut up and down a few times? You can always run it up and down while installed, but it'll be slower. You want to avoid backcurrent, so you'll have to slowly move the nut up and down by hand a few times unless you loosen the Z motor mount and take off the Z belt. The assembly instructions used to reference running the nut up and down the rod a few times before assembly, it's easy to do if you chuck the rod in a hand drill.